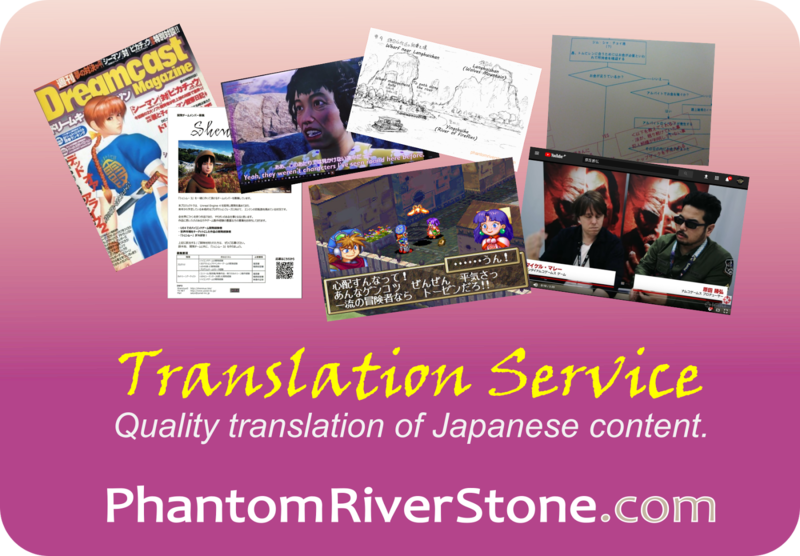 This topic was selected by the Phantom River Stone blog patrons via our monthly poll on Patreon. 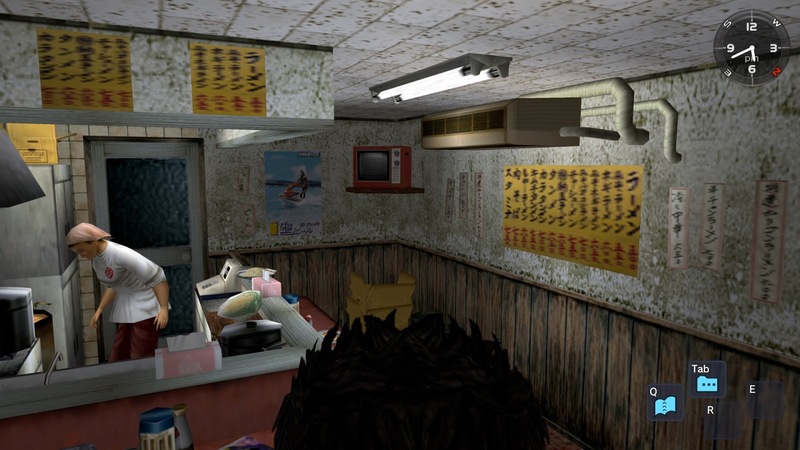 Although Ryo is never seen eating in Shenmue, the attention to detail is just as present with the restaurant interiors as with any of the other locations in the game. They have bottles of sauces and condiments for customers on the table, water dispensers, air conditioners, television sets - and menus showing the names of various dishes, and their prices, served at each establishment. 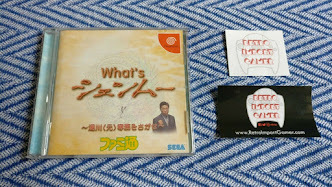 In this new series of posts, we'll be visiting the restaurants scattered around the Dobuita Street area in the first game to see exactly what they have on offer. 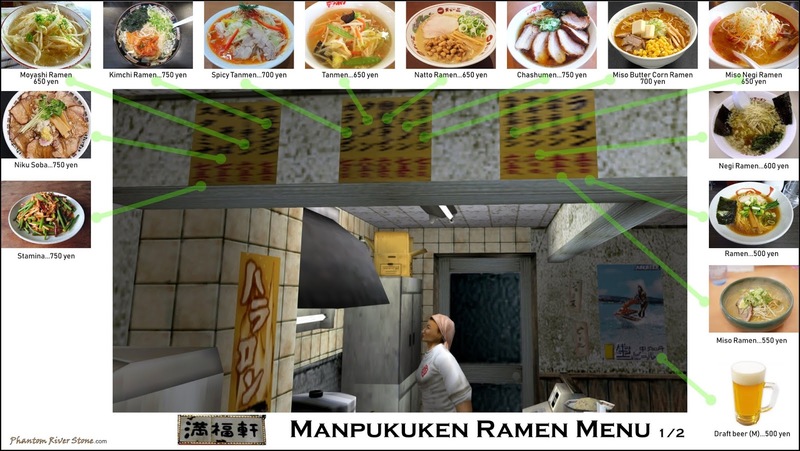 Manpukuken Ramen is a casual Chinese diner operated by Junko Yamamoto, that opens in the late afternoon and does not close until the early hours of the morning. Let's take a seat at the counter and see what they have to offer - the second part of their name is a give-away as to what they specialize in! There is no formal menu to be found in the restaurant. 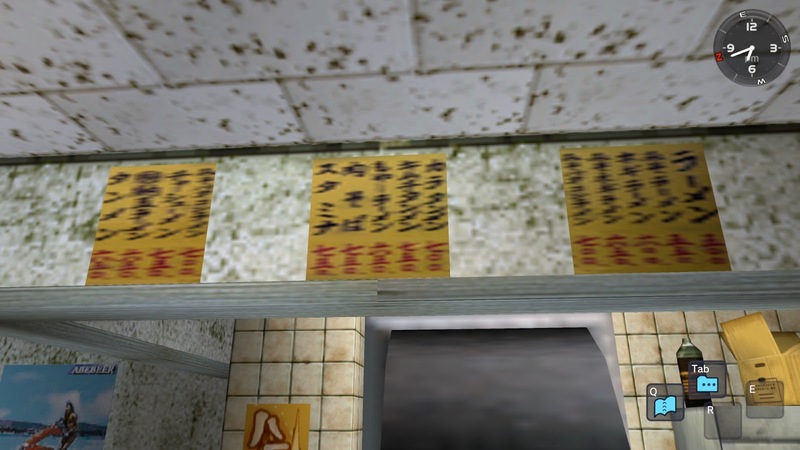 Instead, the names of dishes and their prices are written on pieces of paper stuck up on the walls. For example, above the counter is a range of ramen dishes at reasonable prices. If you are are a ramen connoisseur there is sure to be something here to suit your taste. The standard ramen dish at Manpukuken is 500 yen. Although the flavor is not specified, shoyu (soy sauce) is one of the most common flavorings in the Tokyo region. Miso Ramen is another option for an additional 50 yen. For an additional 200 yen is Niku Soba, which is noodles with meat. For a creamier flavor, there is the Miso Butter Corn Ramen - just as the name suggests, it has a miso base with lumps of butter and a sprinkling of sweetcorn. The Negi Ramen features a serving of green onions in the bowl; also offered with Miso flavoring. Tanmen is a type of ramen soup noodle that is flavored with chicken stock and salt and topped with stir-fried pork and vegetables (650 yen). Also at this price is the Natto Ramen (fermented beans) and the popular Chashumen, which is ramen topped with slices of chashu (pork belly). Continuing on we have the Moyashi Ramen (ramen with bean sprouts), and Kimchi Ramen, which as the name suggests is ramen with spicy Korean pickled cabbage added. A spicy version of Tanmen is also available. Moving to the more expensive end of the menu, you can order a bowl of ramen with a half-bowl of fried rice ("Hanchan Ramen") at 700 yen; a bowl of chilled noodles for 650 yen or the specialty ramen dish of the house at 900 yen - unfortunately the name written on the paper strip is very blurred and I wasn't able to figure out exactly what the special ingredient could be. The next ones are non-noodle dishes. There is a Stamina meal, which usually describes a dish with meat, vegetables and plenty of garlic. The Gyoza dumplings are cheaply priced at only 350 yen, and you can also order a dish of fried rice for 400 yen - you can spot these last two dishes on the restaurant counter when playing the game. 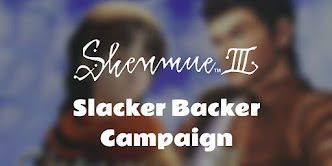 Finally, the drinks on offer include soft drinks, beer and the "Hararon" energy drink (a Shenmue-only brand that does not exist in real life) can be seen advertised on posters around Sakuragaoka, Dobuita and over at the harbor. 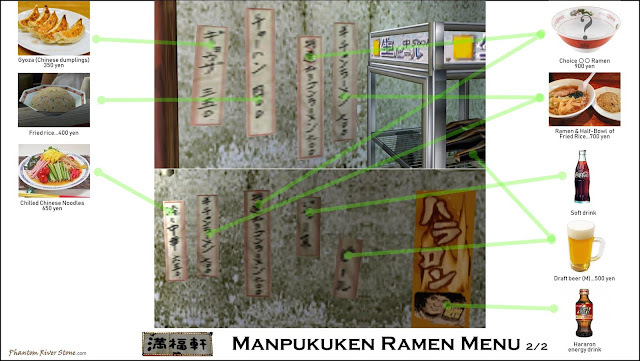 The summary slides below indicate where the dish names are displayed inside the restaurant. 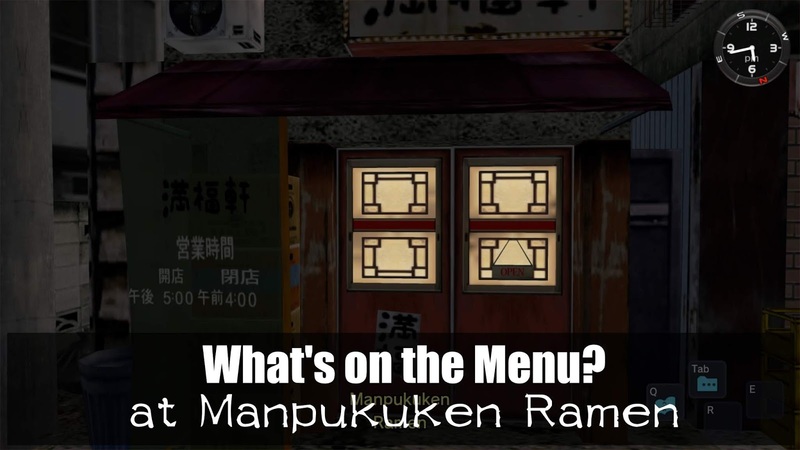 Which of these would you order for Ryo, if you were visiting Manpukuken Ramen - and what restaurant would you like us to visit next?